The golden team of Great Britain, winner in Antwerp 1920 Olympic Games. The British team won against Spain with 9-0, against the US team with 7-2 and finally against Belgium with 3-2. 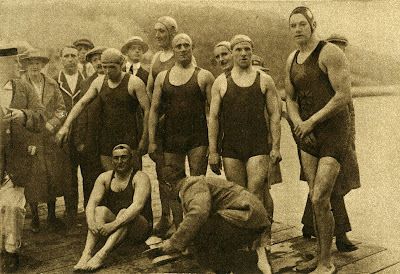 The team: Charles Sydney Smith, Paul Radmilovic, Charles Bugbee, Noel Purcell, Christopher Jones, William Peacock, William Henry Dean. Coach of the team was Paul Radmilovic.